If you think you are the only one who has to live with the problem of bleeding gums or foul breath then think again, your cats have the same issues. Since animals use their teeth for everything, it is natural that the wear and tear on their teeth are more as their teeth are exposed to various kinds of germs and bacteria, and the result is oral health problems. Periodontal disease: This is the most prevalent disease in cats, in fact, more than kidney problems and weight issues( bet you weren’t aware of that). The problem begins with tartar and plaque build-up on the tooth. With the passage of time, this spreads and causes inflammation followed by infection and other issues. Your cat has the condition in varying degrees before she/he turns three. Cancer: this is again common cancer in your kitties. If your cat loses teeth all of a sudden, has a mass formation in the mouth, loses a lot of weight, swelling and drooling accompanied by bad smelling breath all these are indications of cancer. These can be found when you take your cat for a check-up. Hence it is imperative that you get regular check-ups done for your cat too. Stomatitis: This is one of the most painful conditions which is brought on by inflammation or ulceration of tissues that line the oral cavity. Cats with this condition will have red, inflamed mouth and do not like to get their teeth examined. These cats have trouble eating hence are generally malnourished. This can only be cured if it is a mild case severe conditions require surgery. Bad breath: halitosis happens due to some conditions in the oral cavity, the problem could be anything from periodontal disease to infected mass. If loss of appetite and vomiting follows the bad breath, nausea and difficulty in swallowing then the sooner you visit your vet, the better. The regular oral exam is a must. 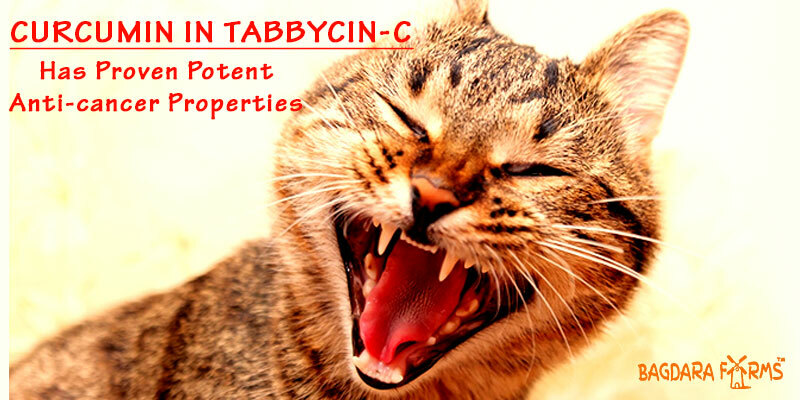 What Tabbycin-C does for your Cat’s Oral Health? Tabbycin-C from Bagdara farms is 100% organic and is carefully crafted under the strictest and cleanest conditions to maintain the purity of the product so that your pet’s health is not compromised in any way. Curcumin is present in an abundant amount in Tabbycin-C making it the perfect foil to combat all oral problems your cat might ever face. Curcumin has proven anti-microbial property which makes it a powerful weapon against germs and bacteria by checking their growth and also preventing plaque formation. Curcumin’s pharmacological properties are well known. The anti-inflammatory action of Curcumin inhibits the activity of inflammation-causing enzymes which in turn plays a significant role in bringing down inflammation. This action is the most powerful tool against all oral problems. Being a dynamic anti-inflammatory agent, Curcumin helps in reducing the swelling and inflammation, which is the cause of all oral problems. The anti-oxidant property of Curcumin inhibits the growth of free radicals which in turn prevents oxidative stress thus protecting teeth from decay and damage. Curcumin has potent anti-viral properties which not only keeps bacteria at bay but also soothes the inflamed and swollen gums. The anti-plaque property of Curcumin helps scrub off the plaque that forms on the teeth over a period. Curcumin in Tabbycin-C also has proven potent anti-cancer properties which ensure in preventing and checking the formation and growth of cancer cells.